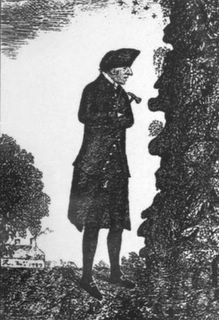 Hutton (June 3, 1726 - March 26, 1797) is considered to be the father of modern geology. He is accredited with proposing that observed geologic processes have been occurring at a uniform rate since the creation of earth, also know as the theory of unconformities. This led to his controversial suggestion that the earth is incredibly old. Hutton began to notice geologic processes on his land in the 1750’s by following his soil during rainstorms when it would erode into the sea. He also noticed how long the process took and began to apply this idea to other parts of geology. If it took this long for some soil to move a few miles than how long did it take to form the cliffs by the sea? He also took note of other features in the landscape such as angular unconformities. A breakthrough point occurred for Hutton when he found Siccar’s Point. This site shows the build up of sediment over a long period of time as well as other geologic processes. It was this idea of continuous processes that fascinated Hutton for the rest of his life. Hutton subsequently moved back to Edinburgh, and became very involved with the Royal Society of Edinburgh. In 1785 he had his friend Joseph Black read his lecture on his theories of earth. This was the first time that his full theory had been made public. He was met with much anger and rejection. Even though we take his ideas for granted today, at the time he was presenting this the oldest proposed age of earth was around six thousand years, as laid forth by the church. While he was able to convince a few by showing them prime field examples such as Glen Tilt and Siccar’s Point, for many it remained too radical an idea to consider. Text modified from HERE. Image from HERE.